This is a timely, self-contained introduction to the rapidly expanding field of quantum information and computation that avoids detailed mathematical proofs wherever possible. The author uses a mixed exposition between a popular and technical approach, connecting the standard results of the field with more recent developments. A complete but not highly technical textbook for students of physics, mathematics, and computer science. Mladen Pavicic is a full physics professor at the University of Zagreb, Croatia. He stayed for more than five years in Germany (Humboldt University and Technical University of Berlin, University of Cologne), in the States (University of Maryland Baltimore County), in Austria (Atom Institute) and others. His research focuses on quantum information. Professor Pavicic is an Alexander von Humboldt and a Senior Fulbright fellow. He has been the head of five successive federal projects since 1996. 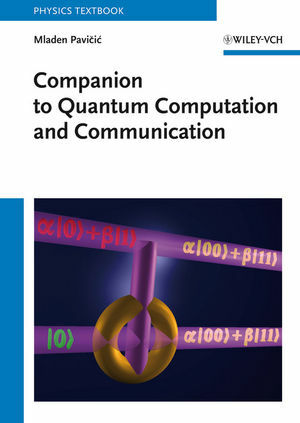 He is author of the book `Quantum Computation and Quantum Communication? and of over 50 scientific articles in international peer reviewed journals. 1.1 Turing Machine: a Real Machine or . . .
1.5 Speeding up Computation: Classical Analog Computation . . .
1.8 Energy Limits . . .
1.19 Copying Qubits? No. Teleporting Qubits! 1.24 Why Classical Cryptography Cannot Keep Secrets for Long . . .
1.25 . . . and why Quantum Cryptography Can? 3.3 Quantum Algorithms: Quantum or Classical Problems? 3.3.1 Are there Universal Quantum Algorithms? 4.2.1 Dumping Reversibility and Unitarity?